I love galettes, or pancakes, or anything that has vegetables in it and that looks like a flat crêpe. Spaghetti squash is a great vegetable to prepare yet not very popular. You can make so many different dishes and in so many different ways. Besides, its texture and aspect are very interesting. I used to serve this squash as a vegetable dish, in its shell, then I got tired of it, and figured, it can be prepared like zucchini. Strangely enough, I have never seen it served in any restaurants…I don’t know why it’s not popular among chefs. Now I am wondering if chefs who own restaurants do come up with menus with specialties they really enjoy preparing or if the completely adapt their menus to the tastes of the local population. Probably a combination of both. Nevertheless, I think that especially in America, where people are more open to new flavors and cuisines due to its melting pot of nationalities, people can easily be “trained” to new flavors and concepts. It is more difficult in Europe, especially France and Italy where everyone is still attached to local traditions and cuisines and are two countries with ancient and reputable culinary history. Those pancakes have little egg and little flour, so as any vegetable pancake, they tend to be a little soft in the middle, this is not a fritter so don’t expect them to have to consistency and texture of a fried dough. One spaghetti squash will be enough to make about 20 pancakes. Start cooking spaghetti squash. Cut in half lenghtwise and wrap in aluminum foil, don’t leave any hole, the foil needs to be well sealed. Cook for about 1h30 min in a 400F pre-heated oven. Check once in a while to see the squash is a little soft but not too soft. If you cook the squash too long, it will be filled of water and you won’t be able to get the spaghetti strands out of it, therefore won’t be able to make those pancakes. When cooked, remove the seeds, and remove the spaghetti-pulp with a fork. Place in a container. In another mixing bowl, mix egg with flour, salt and pepper, to form a thick dough, if the dough is too liquid, add flour. Add chili flakes, oregano, salt and pepper to the squash, mix well. Add egg/flour mixture. Mix with well, and at the end add feta cheese. Mix using tip of your fingers not to break the feta, you want to keep some chunks. Heat olive oil in a pan, and spoon one large tbs of the mixture in pan. Cook on both sides, at medium size heat. You might need to adjust heat not to burn the outside of the pancakes but still brown them and cook them inside. Serve hot with a salad, or as a side dish. This entry was posted by silvia on August 15, 2009 at 11:24 pm, and is filed under Appetizers, Side Dish, Vegetables. Follow any responses to this post through RSS 2.0.You can leave a response or trackback from your own site. This is a great way to use spaghetti squash! I love to eat it mixed with a light vinaigrette and feta cheese, but am definitely going to try your recipe. I love spaghetti squash, though I hardly buy it. This sounds great, I would have never though to do something like this. I would probably add a full tsp of red chili flakes, but thats just me, I like my things spicy! Yes, that sounds good too. I have extra squash that I might try to make as a gratin with tomatoes. We’ll see if it’s worth posting! Thanks for the comment. Thanks, yes vegetable pancake is a good way to make kids eat veggies! Yes, it’s funny how we tend to forget certain vegetables. Thanks! 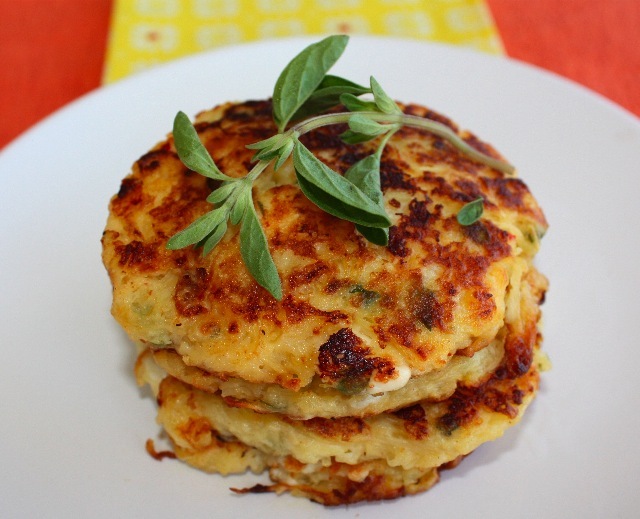 you could also make zucchini pancakes the same way, they really are delicious. We’re big spaghetti squash fans…and veggie cake fans. Sounds like a must try. I love spaghetti squash and had never thought of using it this way. I normally substitute it for pasta, and I love making a veggie mix and throwing it on top instead of using sauce. My favorite is a black bean mixture. I’ll have to try this recipe next time I pick one up at the market. Thank you! Another great one, this might have to go into the rotation for this week!! Looks so delicious!! I love pancakes too and this is such a good idea -thanks!